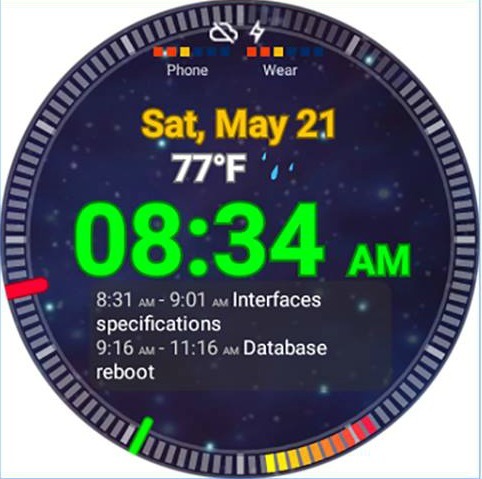 If you are looking for a cool looking watch face for your Android wear devices, we have the suitable app for you. The app that we are talking about is called Ultrawatch Free Watch Face, developed by Reunidev Apps and available for free on the Android platform. This innovative app is fully u customizable watchface for your wear and it is designed with lovely graphics and features. The Ultrawatch Free Watch Face app allows you to choose between multiple faces, from SciFi to a minimal one. It uses analog or digital display and it contains dozens of things that you can set-up according to your own liking. You will be able to see the exact time and date, and the temperature as well. There is a built-in battery meter, steps counter, next calendar events, etc. Go to the settings menu and adjust the weather refresh interval, increase the interactive mode duration and choose the background. You can even change colors and textures of any displayed feature. Install the app and run “resync app” on your Android wear if not available or make along press on your watch and choose Ultrawatch. The app is compatible with round watch and tested with LG Watch R. Download it now for free from Google Play.